Package Contents: 6 different handle patterns forks. Perfect for fruit, dessert, pastries, cakes, salad, cocktail, pickle, appetizer or seafood, etc. Great for home, banquet, restaurant, cafe, bistro, bar or wedding party, etc. We consistently provide quality products and best service to satisfy our valued customers. If there are any better suggestions, please feel free to let us know, so we can better our product and service, we want to make sure you enjoy it. 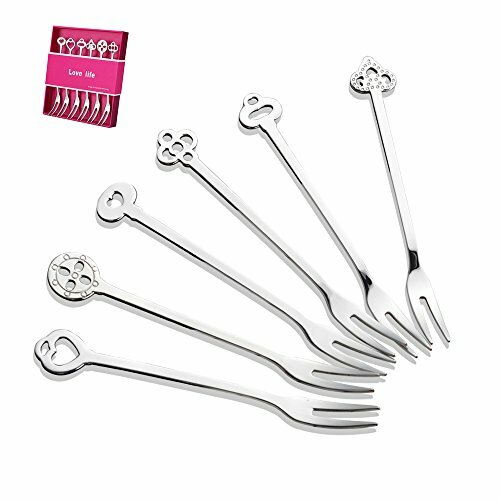 6 fine style, simple fashion, compact and practical forks with different handle patterns for easy recognition in one gift box. Made of high quality 18/8 stainless steel, Dishwasher safe. Great for home, banquet, restaurant, cafe, bistro, bar or wedding party, etc. The forks are elegant, glossy and polished finish. Exquisite packaging, gift choice. If you have any questions about this product by Yolopark, contact us by completing and submitting the form below. If you are looking for a specif part number, please include it with your message.